I have a handful of recipes that my mother passed down to me, and this is one of my favorites. I affectionately call it "Two by Four" Soup, because it is simply two cups each of four ingredients. So, so easy, and so so good. All you do is dump it all in a pot and let it simmer for fifteen minutes or so, then serve with whatever garnishes and toppings your heart desires: I typically top it with some extra salsa, a little sour cream, and shredded cheese. In the past I've also done guacamole, diced avocado, cilantro, jalapeños... really anything you'd serve with chili works here. I like to serve it with cheese quesadillas, or I'll keep it simple and just eat some chips and salsa with it. Or I'll try and be healthy and have it with a salad. The world is your oyster... errr black bean soup. So about those four ingredients. 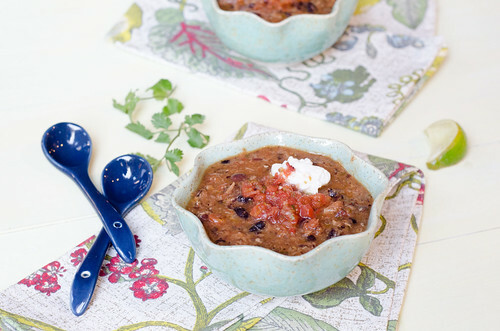 Black beans, salsa, broth, and a protein of your choice. I just go with whatever I have on hand: be it shredded chicken, pulled pork, ground turkey, chicken, or beef... I've even used chopped ham after Easter before! And oftentimes I just omit the meat altogether and make it a vegetarian meal. My preference for the salsa is to use my rustic roasted salsa, but I've used store-bought in a pinch before. The roasted tomatillo salsa is pretty fabulous as well, and it gives you a totally new flavor profile. As you can see, this is infinitely adaptable. And with it being so easy, it's a great meal to have in your back pocket for busy nights. The leftovers reheat beautifully, making it a perfect soup to have around for lunches. As we hunker down for yet another cold snap, I'm craving soup more than ever. 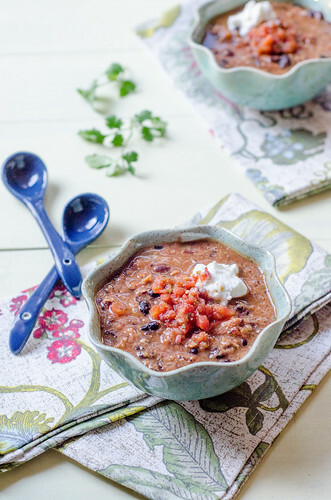 This soup is not only totally delicious and easy, but it reminds me of my sweet mom - foods that make you think of family are always the best ones, aren't they? I like my soups on the thicker side, but if you prefer a thinner consistency, just add a little more broth, or skip the immersion blender step. In a medium saucepan, combine the salsa, beans, broth, and meat. Bring to a simmer over medium heat, cover, and cook 15 minutes. Using an immersion blender, give the soup a few pulses to create a bit more of a creamy, chunky texture. Divide among soup bowls and serve immediately with desired toppings. I have a feeling I'll definitely be craving a big bowl of something warm and hearty like this tomorrow when it is beyond cold here! Love how easy it is! It really is a dish easy to make and easy to eat. I really liked it and thought I would try processing it in a certain Sundays. Recipes passed down are the best. I absolutely love this!